Two weeks ago, I attended a class that Karen Neary taught. She is a well known Canadian quilt teacher and designer, who lives in nearby Nova Scotia. This class is called the Maritime Beauty. She has done many variations using just 2 blocks and if you go to her galleries on her website, you can see the various colorations. The fabrics that I used for my Beauty were mostly in a bag of scraps that I had for a long time. I thought I'd use up the majority of these scraps, only to find out, that I could make 10 more Beauties like this with what I have left over. But I am not going to do that. I am going to make another Maritime Beauty in more organized colors. I just don't know what... maybe Christmas colors, or fall colors, or maybe the yellow and black one that is shown in Karen's gallery. I'll decide later. I haven't quilted or bound this Beauty yet. 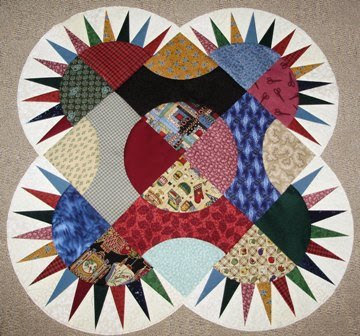 I am going to wait for my new Juki and this will be my first piece that I machine quilt with it. Watch for an update in about 10 days. Thanks for helping me get over my curves phobia Karen!! Hi, Gail: Thanks for such a nice blog post. Your Beauty looks great! The arrangement you chose for the centre blocks adds to the 'scrappy" look of the piece. I bought a Juki serger about 16 years ago, and based on that machine would not hesitate to buy another Juki. It has logged many, many sewing hours and been completely problem free. I wish you luck with your new one, and look forward to seeing your Beauty quilted. It's beautiful Gail. I can't wait to see it. I want to try and Maritime Beauty soon.